White Lake Is a body of water in Bladen County containing some 1,200 acres and is a commercial resort area. White Lake has an average temperature of 63 degrees and an average rainfall of 49.06 inches. 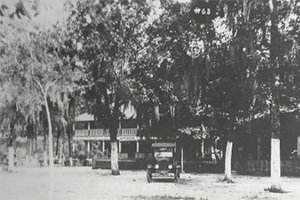 White Lake's first commercial operation opened in 1901. The town was incorporated in 1951 and has a population of approximately 857 year-round with about 200,000 tourists visiting the Lake each summer. White Lake offers excellent swimming, boating, wake boarding, jet skiing and water skiing opportunities that help make that perfect family vacation. In addition, the lake has amusement parks, and numerous other recreational facilities. Motel, cottage, and campground accommodations are available as well as permanent home sites. A beautiful 18-hole golf course is located between White Lake and Elizabethtown. White Lake is unique in that it has a white sandy bottom and is blessed with crystal clear waters. This is because it is fed by subterranean springs. It is truly a child's paradise in that there are no currents, no tides, no hazardous depressions or real dangers of any kind to swimmers. It has been labeled "The Nation's Safest Beach". Some of the accommodations are open all year round. 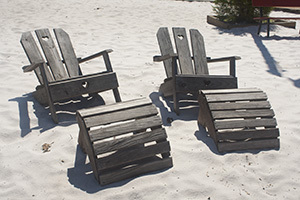 It is a choice resort area for southeastern North Carolina and one can spend an active and exciting day on the beaches and in the arcades, or a leisure time in the deep cool shade. White Lake is proud to be the home of the annual "White Lake Water Festival which is held the third weekend in May each year." Dining - Breakfast, Pizza, Sea Food, Steaks, Deli, etc. Jet Skiing, Water Skiing, Wake Boarding, Sun Bathing, Diving & Other Water Sports. White Lake is a natural, spring and rainwater-fed lake, some 1,200 acres in size, and located in southeastern North Carolina. It is one of the Carolina Bays that sweep across the eastern coast of North America from Delaware to Central Florida. Ralph Preston Melvin opened the first public beach property in 1901 on the south side of the lake. Melvin’s Beach, offered a dance floor, hotel, and two bathhouses. In 1921, two additional public beaches opened on the northeast side of the lake. 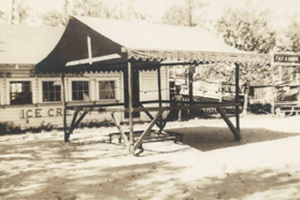 Crystal Beach and what would eventually become Goldston’s Beach entertained visitors with dance floors, hotels, sandwich shops, bathhouses, rides, and arcade games. Percy Melvin built the first tour boat, the Lady of the Lake, in 1924. It would be followed by the Lilly I, II, and III, two glass bottom boats, and a paddlewheel boat. In the 1930s, 40s, and 50s, White Lake experienced rapid growth and popularity. The public beaches hosted elaborate formal dances with visiting bands including Lew Gogerty and His Nationally Known Orchestra and the Johnny Long Orchestra. On the morning of July 2, 1957, an inexplicable fire on the Crystal Beach property moved aggressively onto the adjacent Goldston’s Beach, consuming most of the waterfront buildings on both properties. The community and local businesses rallied to the aid of the two public beaches, constructing temporary facilities for the approaching Independence Day visitors. Both businesses reopened two days later for the July 4th holiday. The community hosted the Blueberry Festival from 1967 until 1973. In 1979, the White Lake Water Festival emerged and continues today. The Melfest Bluegrass Music Festival began in 1999 and thrived for ten years. Waterskiing was a growing sport on White Lake in the 1950s and by the 1970s, the White Lake Ski Heels had emerged. The show team traveled across North Carolina performing ski shows at festivals, fairs, and events. By 1985, seven local skiers had skied professionally with Disney World, Sea World, the Tommy Bartlett Water Ski Team, the Jimmy Durham Show Team, and the World Expo in Okinawa, Japan. White Lake skiers won water ski tournaments on the state, national, and world level platforms. The 2017 Men’s IV champion trick skier in the National Water Ski Tournament is a native of White Lake. He also coached the Olympic Water Ski team. 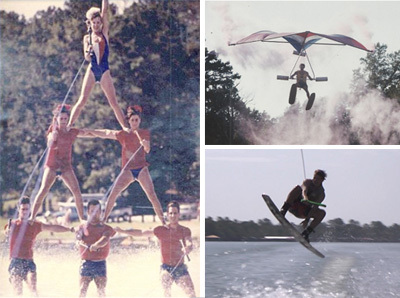 The club introduced hang gliding to White Lake, hosting the second largest tow hang gliding tournament in the world on White Lake. 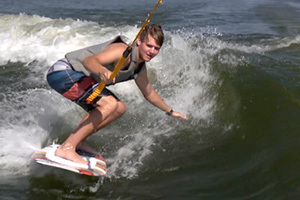 Expert wakeboarders have also dominated competitions with local wakeboarders placing at the national and world levels.